In Australia, buffalo grass is the common name of Stenotaphrum secundatum. Buffalo grass (Paspalum conjugatum P. J. Bergius) is a spreading perennial grass with long creeping stolons rooting at the nodes. Culms are red-purple, ascending to erect and 30-60 cm high. Leaf blades are 8-20 cm long x 5-12 mm broad. The leaf sheath and leaves are hairy on the margins. Inflorescence is composed of 2, 7-16 cm long, diverging racemes. Spikelets are solitary with long white hairs on the edges (FAO, 2010; Ecoport, 2010; Manidool, 1992). Buffalo grass is generally used as fresh grass in pastures and cut-and-carry systems, or for hay (FAO, 2010). It is suitable as lawn-grass. It withstands mowing and foot-wear (Burkill, 1985). Paspalum conjugatum probably originated from the American tropics and is naturalized in almost every tropical and subtropical regions (FAO, 2010). It is commonly found in hot humid areas (river banks, roadsides and disturbed areas) and in open moderately shaded areas (coconut, rubber and oil palm plantations). It can grow on a wide range of soils including acid ones (Manidool, 1992, Stür et al., 1990). It is drought-resistant, remaining green long into the dry season (Burkill, 1985). 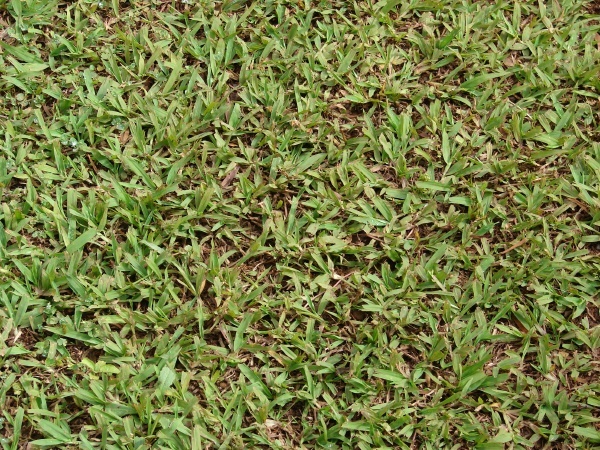 Paspalum conjugatum is a natural pasture in coconut plantations where it yields 19 t/ha fresh matter with no fertilizer and up to 30 t/ha with NPK fertilizer (at 310 kg/ha) (FAO, 2010). 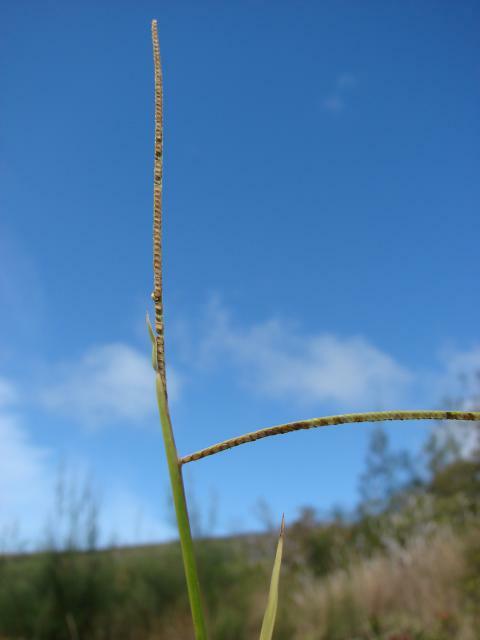 Paspalum conjugatum may help to control the spread of Imperata cylindrica if the pasture is grazed heavily (FAO, 2010). However, it is also a major weed of rice fields in South and Southeast Asia (Ecoport, 2010). Paspalum conjugatum may invade forest clearings and may impede forest regeneration (Burkill, 1985). It has been reported that young seeds tend to stick in the throats of livestock and choke them (Deshaprabhu, 1966). It contains a haemostatic glucoside (paspaloside) that reduces the time for blood clotting by 50% (FAO, 2010). Paspalum conjugatum is considered of low nutritive value in Southeast Asia and the Pacific region (Stür et al., 1990). Its usefulness is limited by its low protein content (6-15% DM) and unpalatability for cattle, though both aspects might be improved by light applications of nitrogen fertilizer (Beetle, 1974). It should be grazed young as palatability declines rapidly after flowering (Chavancy, 1951). Palatability is higher for buffaloes than for cattle (FAO, 2010). As Paspalum conjugatum is tolerant to defoliation it withstands heavy grazing and frequent cuttings. This management regime prevents seed head maturity, the subsequent lowering of nutritive value and promotes faster regrowth of higher quality and palatability (FAO, 2010). When mature the crude fibre content reaches 28% DM in leaves and 40% DM in stems. Organic matter digestibility for a 25 cm high, fresh forage was 65% (Loosli et al., 1954). In spite of its low palatability, Paspalum conjugatum grazed by dual-purpose cows in a herbaceous and woody pasture was one of the most preferred grasses, together with Guinea grass (Megathyrsus maximum), jaragua (Hyparrhenia rufa), toco grass (Ischaemum ciliare) and Paspalum virgatum (Pineda et al., 2009). Paspalum conjugatum grown under coconut trees in Vanuatu was found to establish easily, to be resistant to grazing and weed invasion, and to maintain its nutritive value throughout growth. 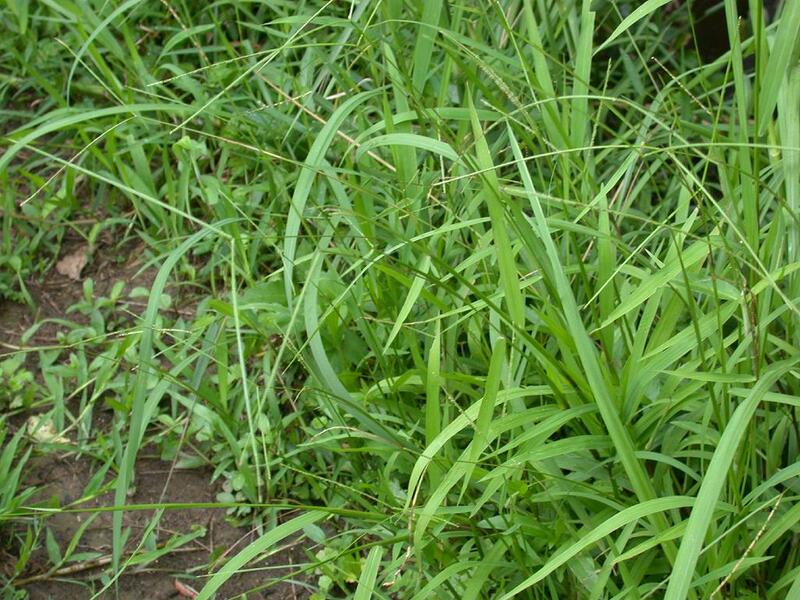 Grazed Guinea grass/buffalo grass pastures led to higher coconut yields and were considered to be very suitable for goats (Coulon et al., 1983). Manidool, C., 1992. Paspalum conjugatum Bergius. Record from Proseabase. Mannetje, L.'t and Jones, R.M. (Editors). PROSEA (Plant Resources of South-East Asia) Foundation, Bogor, Indonesia.